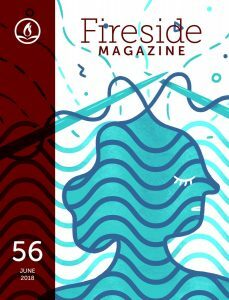 Fireside Fiction #56 provides four short pieces, of which the most memorable is “Cast Off Tight” by Hal Y. Zhang. A man is grieving the loss of his girlfriend when he realizes he can literally hear her when he touches her unfinished knitting project. 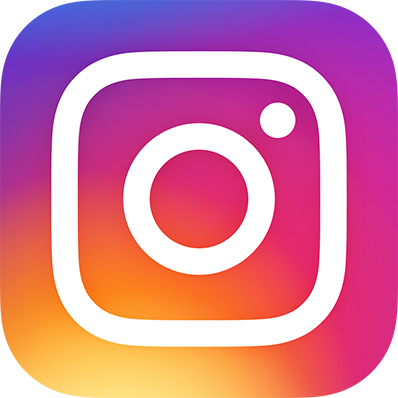 A trip to the yarn store yields a new technology (thread that can encode the environment around it as it is being knitted or woven), a new hobby, and a new pathway out of crushing grief. GigaNotoSaurus for June has “Balloon Man” by Shiv Ramdas, a lovely, mythical story of a virtu­ous king condemned to do good deeds, the trickster god who got him into that mess, and the boy who hears the story (told by magical balloon animals) and becomes part of it. The structure of multiple continuing tales told by magical balloon creatures works very well, and the settings of the tales, from the abode of the gods to a space formed after a cave in, are lavishly drawn. 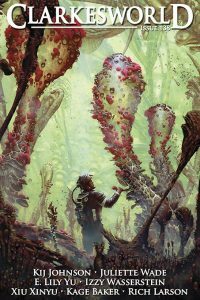 Strange Horizons leads off July with two strong SF stories. “The Athuran Interpreter’s Flight” by Eleanna Castroianni deals with human/alien hybridity from the point of view of the new being. Diving deep into horrific imagery, the titular Inter­preter is a young girl implanted with an elder alien brain that creates a perfect translator, supposedly incapable of making any sound other than a perfect interpretation between the language of her owner and those of his business partners. As a treasured possession, he grooms her and uses her in every way he desires, with all the awfulness that implies. Eventually reconnecting with the home culture of her brain, a very small act of rebellion has huge consequences for her owner and herself. Next, in “Chasing the Start“, Evan Marcroft introduces us to a futuristic extreme sport, a physical race in exoarmor that travels between extreme circum­stances throughout time and space, ranging from the streets of Pompeii during the eruption, to the day a logic bomb hit Pluto. Sa is an aging champion, continuing to race long after her manager/partner feels it is safe, as the media treat her as a novelty and her competitors take especial glee in gunning for her. Why does she keep going long past her prime? The answer takes advantage of time travel tropes in a nice climax/resolution. Moving into August’s Strange Horizons, “Orphan Tsunami Heathens” by Tiera Greene is another very dark story. Klein is a biracial woman who had briefly escaped her (post-climate change) flooded hometown for an Arizona college. A death in the family brought her back to in-state tuition and a campus where the years of flooding have brought forth a cadre of vampiric were-fish and a subculture that supports them. Klein, having herself trans­formed earlier in life, feels alien and alienated on many levels. She avoids feeding as long as she can, despite pressure by her friends to fit in. Here again, the human/animal/supernatural melding goes to very dark places. 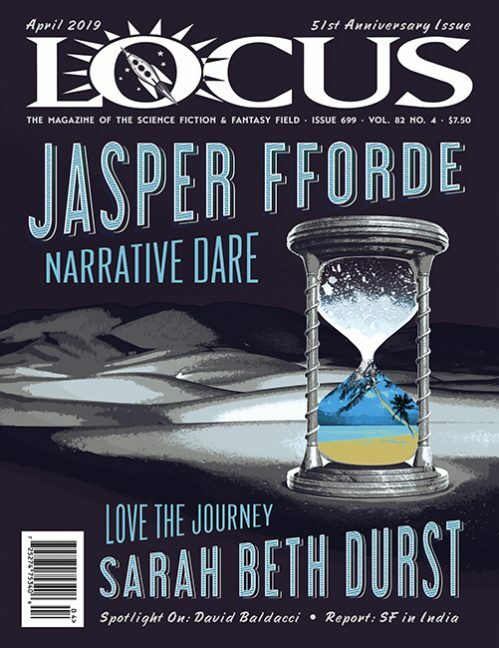 June brought the second issue of a new Canadian speculative fiction and poetry magazine, Augur. Editor in Chief Kerrie Seljak-Byrne puts the focus of the magazine on intersectionality and Canadian voices. Three stories stood out to me, starting with “The Steam-Powered Princess” by Aimee Og­den, in which a fairy tale king and a queen turn to a technomancer to make themselves a daughter. Oppressed by expectations at home, the titular princess is eventually kidnapped and, in rescuing herself and others, makes a place for herself in the world – a nice counterpoise to the horror sometimes found in other human/machine hybrids. “The Fall, the Water, the Weight” by Lina Rather follows four high school friends who deal with loss as they grow up and change; the waterfall at which they congregate both in youth and middle age may have a connection to the fairy world. A.C. Wise gives us “With One Tongue“, an incredibly creepy and claustrophobic story where a group of women slaves in a single household share literally a single tongue, and there’s a system for who gets it on any given day. 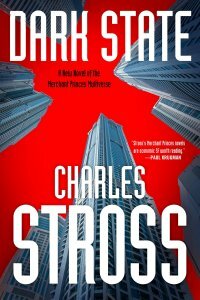 The POV protagonist moves from a state of namelessness to claiming an identity and eventually fighting back against the master and the system that supports him. In both Wise’s and Ogden’s stories, I appreciated the ray of hope offered to those in need of escape from different sorts of stiflingly oppressive circumstances.